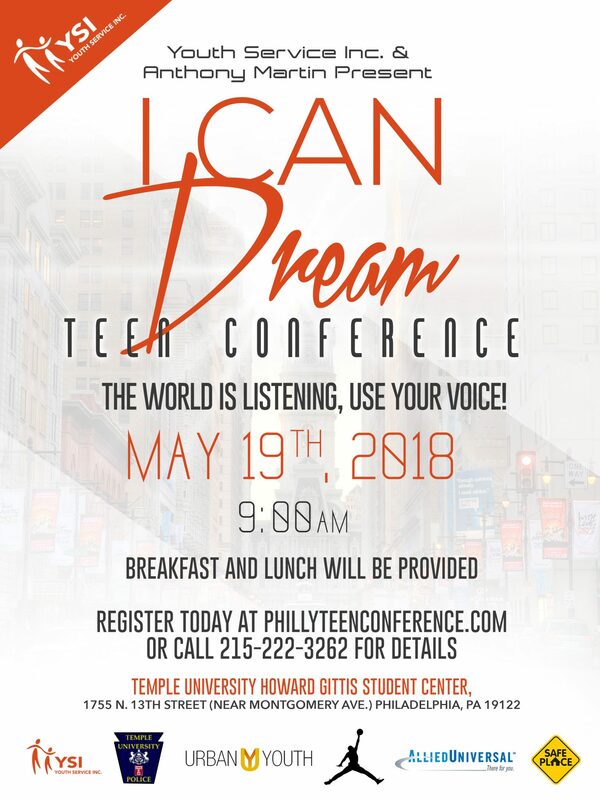 WHAT: Organized by Youth Service, Inc. (YSI) and Anthony Martin, the 16th annual “I Can Dream” Teen Conference is a unique opportunity for city youth to build self-esteem and chart a positive path for the future. The conference is for youth ages 12 to 18. Our theme this year is “The World is Listening, Use Your Voice!” The conference will be an opportunity for teens to challenge the status quo, give a voice to their powerful ideas, and unlock their potential as a problem solvers, role models, and change-makers. This year’s conference will feature: access to community members who are excited to share ideas, stories, and insights; brainstorm sessions and fun workshops; peer to peer networking opportunities, food and giveaways. Our keynote speaker and Youth Advocate this year is Lee England Jr., an accomplished violinist who has performed with Stevie Wonder, Elton John and Quincy Jones as well as play at 26 NBA arenas. In addition to his musical accomplishments, England Jr. has created the non-profit Love Notes Music Organization to help youth achieve their potential by providing workshops, Artist in Residence programs, summer camps, instruments, and performance opportunities. This year’s conference and after party will also feature performances by Urgent 365, DJ D-ILL, Project Postive, Rising Sons dance squad, Life Outside The Streets’ performers Blackcease, Kid Chop, TB Flamez, Beezy, Dee and Emyne, fashion by Wise Hustlers& SCRSE Apperal and a dance performance by West Philly High School girls dance squad. NBC 10 Philadelphia news anchor and reporter, Denise Nakano, will be a special guest coach as well. Outstanding Role Model of the Year: Iman K. Na’eem-Robinson, a young woman who had her friends bring brand new pajamas to be donated to YSI instead of gifts to her recent Sweet 16 Party. Champion of the Year: Tamir Harper, a senior at Science Leadership Academy, Student Ambassador for The Fellowship for Black Male Educators for Social Justice, Co-Founder for UrbEd and Student Advisor for School District of Phila. Tamir is from Southwest Philadelphia. He has truly used his voice to bring positive change! Please check out his website: Tamirdharper.com. Justice Advocate of the Year: Meek Mill, local hip hop artist, who is actively advocating for reform in the justice system. In addition to his advocacy for justice reform, Mill has visited the youth at our teen shelter in the past and has pledged to donate $10,000 to Youth Service, Inc. this past January. *Appearance depending on availability. WHEN: Saturday, May 19th 2018 from 9 a.m. to 3 p.m. followed by after party at Temple’s The Underground from 3 p.m. to 5 p.m. Interested teens and volunteers can still sign up for the conference for free at: http://phillyteenconference.com/ .